I assisted Uber South Africa on the National Land Transport Amendment Bill, with identifying key stakeholders to engage and engaged key stakeholders. One such example was the meeting I facilitated with the House Chairperson of the NCOP. The success of the meeting was largely due to me being a known stakeholder at Parliament. This assisted Uber delivering its key messages in a comfortable environment. I also facilitated a committee meeting in May 2018 between the Standing Committee on Finance, various government institutions and TISA on the illicit trade in tobacco products and its relations to loss of revenue to government. 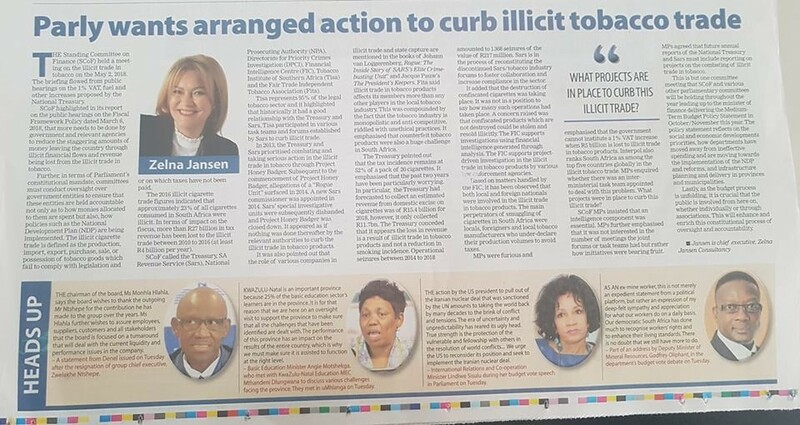 A constructive outcome of the meeting was that SARS report to Parliament on its activities to curb illicit trade in tobacco products. The facilitation of the meeting was largely due to my credibility, network and policy-making process expertise. My opinion editorial analysing the outcomes of the meeting was published in the Sunday Independent. I also partnered with tralac to host a workshop in 2017 on intellectual property law in the Southern Africa region. My roles as the former Deputy Chairperson for Business Western Cape (BWC) and former Deputy Chairperson for the Progressive Professionals Forum Western Cape (PPF WC) enhanced my interaction with senior political stakeholders, Free Market Foundation, South African Chamber of Commerce (SACCI), Business Unity South Africa (BUSA), Consumer Goods Council of South Africa (CGCSA), Black Business Council, various informal traders’ associations, to name a few. As the former Deputy Chairperson for BWC, I have interacted with the Cape Chamber of Commerce and Industry (CCCI), National African Federated Chamber of Commerce and Industry (NAFCOC), Black Business Chamber (BBC) and Western Cape Business Opportunities Forum (WECBOF). As the former Parliamentary Liaison Officer (PLO) for the Law Society of South Africa (LSSA). I assisted in creating an environment within which the LSSA can interact, comment and make constructive inroads on legislation before Parliament and to build and maintain effective networks for the LSSA. This linked me to stakeholders within the justice cluster. My credibility, extensive network and expertise has assisted me in achieving measurable inroads into the legislative process, including briefings to various Parliamentary Committees where various stakeholders had opportunities to consult, build strategic networks and find meaningful Solutions.